After being taken to the woodshed by ABAC, the Pirates had an eleven day break from outside competition to go to work on the practice field and get some things fixed before their annual showdown with Columbus State University. In what has become the outside grand finale for CVCC since the Fall of 2009, the Pirate baseball team headed across the river to face CSU in what always turns out to be a playoff atmosphere and two very good baseball games. The Pirates went to work offensively right out of the gate, as James Cunningham led off the game by reaching on an error on his hot shot that the Cougar second baseman could not handle. Matt Nettles followed him up with a single of his own and the Pirates jumped on top of CSU 1-0 on Nick Jones’s 1st of 5 RBI’s on the day with an RBI groundout. Ben Taylor earned the start for CVCC and was nothing short of dominant, as he threw 3 shutout innings and allowed only a single baserunner. CV got back on the board in their half of the second inning when Jared Martin drew a one out walk and Timmy Massengale reached on error. Cody Walker promptly stepped in and delivered a 2 run single to push the lead to 3-0 in favor of the good guys. The third frame saw the Pirates put a crooked number on the board, pushing 3 runs across the plate. 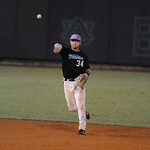 Matt Nettles led the inning off with his second hit of the game and Ty Abbott followed suit with a single of his own. Nick Jones then roped a laser beam in the gap to score both Nettles and Abbott. One out later, Cam Sperry hit a liner into right center field to score Jonesy, and give the Pirates a comfortable 6-0 lead in the process. Freshman Dalton Rentz came on in relief of Taylor and although was not his typical dominant self, was more than effective, allowing only 2 earned runs in his 3 innings of work. The Pirate offense didn’t slow down and answered the Cougars 3 runs by putting up 3 more of their own in the 5th inning. Nettles reached on his 3rd hit of the day and Abbott did the same with his second. Nick Jones came up and continued his hot hitting with his second hit and 4th and 5th RBI’s of the afternoon with another 2-run double in the gap and later scored on Sperry’s RBI groundout to give the Pirates an unsurmountable 9-3 lead. The scoring for both teams ended there as the Pirate bullpen took over and put zeros on the board for the final 3 innings, as Hunter Mitchell, Nick Jones and Matty Evenson combined for no hit baseball to close out the big win over CSU. Game 2 was one of the more odd games witnessed by many in a long while. Both pitching staffs were completely dominant and for 5 1/2 innings pitched, there were only 5 hits between the two teams, 3 by CVCC and only 2 by CSU. Unfortunately, the other half was a 9 run, 9 hit explosion by the Cougars in the 4th inning. As odd as it may sound, other than that abberation, the Pirates completely dominated the game. Nate Morris got the start in game 2 and was magnificent, striking out 3 of the 6 Cougar outs and working masterfully out of a leadoff double jam in the 2nd inning. Offensively, Dominique Smedley led the game off with a single, but the Pirates never really threatened until the 4th inning when back to back 2 out singles by Gaige Garrett and JD Perry seemed to have the Pirates poised to draw first blood. However, the Cougars ended the Pirate threat with Garrett being thrown out at 3rd base on Perry’s basehit to keep the game in a scoreless tie. What happened in the fourth was inexplicable and utterly indescribable. While the PIrate pitching staff absolutely handcuffed the Cougars literally 14 out of 15 innings, it was the 1 that got away that was the Pirates undoing. CSU had 7 batters in a row reach base via the basehit. walk, and hit batsman enroute to scoring 9 runs in the inning. Freshman Coltan Ramsey came on in relief of Dylan Lee to put out the Cougar fire. Things went immediately back to normal, as relievers Casey Hanna and Kevin Moore tossed the final two innings of no hit, shut out baseball. However, the offense never got on track and found themselves on the wrong side of a 9-0 loss. One of the most stand out statistics of the day, was that the two offenses combined for a total of 18 strikeouts in the 7 inning affair.